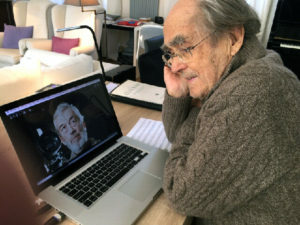 Monday was an especially fun day, as I got to break a story I’ve been working on for weeks — that the Oscar-winning French composer Michel Legrand was scoring his second Orson Welles film, The Other Side of the Wind — some 44 years after their collaboration on F for Fake, the legendary filmmaker’s final completed film. Welles shot this between 1970 and 1976 and had hoped for another Legrand score when it was finished — which, like so many Welles projects, never was. The producers who are completing Wind reached out to the composer last year and received an enthusiastic “yes.” I was lucky enough to get quotes from both producer Frank Marshall and Legrand for the story, which Variety published to a surprising and immediate global response. This entry was posted in Composers, Film Music, Interviews and tagged F for Fake, Michel Legrand, Orson Welles, The Other Side of the Wind, Variety on March 20, 2018 by Jon Burlingame.